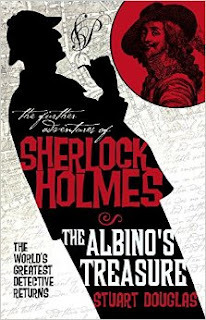 Sherlock Holmes and Dr. Watson attempt to prevent two rival criminal masterminds, Zenith the Albino and the Chinese Lord of Strange Deaths, from getting their respective hands on a mysterious but precious item called “England’s Treasure.” Donald Petrie is the Secretary of the National Portrait Gallery. Zenith the Albino is one of Sexton Blake’s greatest foes. Although Zenith first battled Blake in a 1913 story, this novel demonstrates that he was already active well before then. “The Lord of Strange Deaths” is one of Fu Manchu’s appellations. Donald Petrie may be a relative of Dr. Petrie from the Fu Manchu novels. For write-ups of this and many, many, many more crossovers, check out Crossovers Expanded Vols. 1 and 2, my AUTHORIZED companions to Crossovers: A Secret Chronology of the World Vols. 1 and 2 by Win Scott Eckert, coming out from Meteor House in July!